Camilla Power (born November 13, 1976) is an Irish-born English actress who is most notably remembered in her role as Jill Pole in BBC's TV adaptation of the book The Silver Chair (1990) by C.S. Lewis. The show was aired in the six Sundays preceding Christmas 1990, shortly after her 14th birthday. This was followed by parts in 'Bonjour La Classe' for the BBC (1993), and 'Moonacre' (BBC) (1993) a part which involved horse-riding. Other early parts have included: 'The Manageress' (Ch4)(1990). Power started acting from an early age; her very first TV appearance was on a chicken nuggets advertisement. She made her stage debut in "The Prime of Miss Jean Brodie" at the National Theatre in 1998. Her voice was featured in the English dubbed version of Alice. 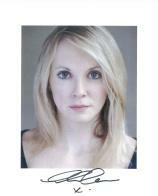 She was a regular cast member on Yorkshire Television soap Emmerdale as Jessica McAllister for two years. She had a small role in the television show Murder In Mind. In 2006 she appeared in the BBC drama Waterloo Road as English teacher Lorna Dickey and returned for the second series in 2007, until her character committed suicide having been diagnosed with multiple sclerosis. Power was born in Cork, Ireland and is a distant cousin of Irish actor Tyrone Power. Power's great-grandfather was Sir John Power, Member of Parliament for Wimbledon before the Second World War. Power Hall at Chatham House is named in his honour. She attended the Sylvia Young Theatre School in Marylebone. During her teenage years, Power's heart-throb idol was film actor Liam Neeson according to Inside Soap magazine 1994. She has a partner, but is not married and has one child from a former relationship. In early 2008 she starred in Torchwood episode From Out of the Rain as Pearl, a circus star who escapes an old cinema film and seeks revenge on those who put her out of business. Power can be seen in the British action movie The Tournament as the ruthless assistant to Liam Cunningham's Tournament Master.